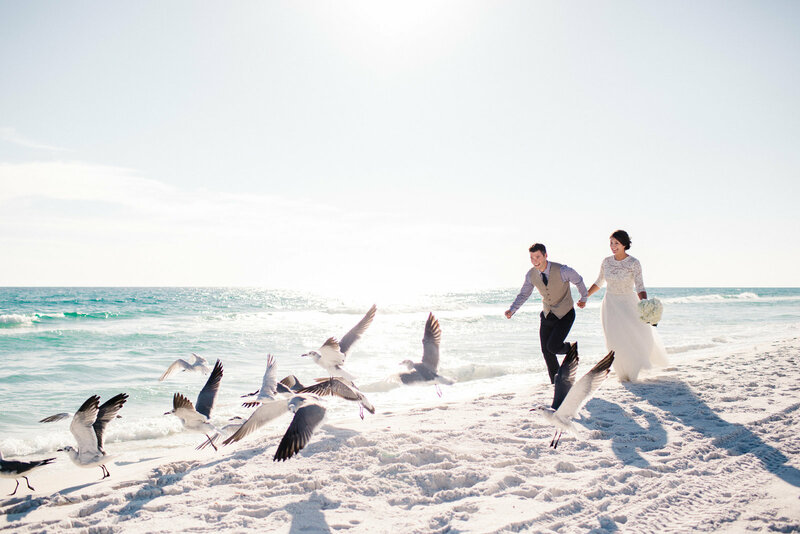 I am so excited to share Dan and Ann’s beach wedding from the gorgeous Destin, Florida with y’all today! I’m so tired of snow and all things cold, so I thought this would be the perfect day to share their images! Dan and Ann’s day took place at the gorgeous Capitano House, right along the beach. With a gorgeous winding stairway, perfect for a first look, the prettiest ocean and white sand beaches, to the reception on the roof, we could not have asked for a better day! Grayton Beach Catering took care of the details, planning and food for the day, while Sweet Henrietta’s Treats, covered the cakes. The most incredible cakes! Ann, who wore a stunning two piece dress from Willowby by Watters, and her family took care of the florals for the day, and everything fell into place! I could not have asked for a more beautiful day with wonderful people. When it came time for the ceremony, family and friends simply gathered around these two, making for intimate vows along the beach.